Due to its compact design combined with high quality X-ray components and with the powerful software package RayWare®, RayScan Mobile provides a three dimensional insight into test objects even if the objects are only partially accessible. RayScan Mobile can be applied to the tomographic inspection of pipelines, airplane wings, rotor blades, pillars or statues. The modular design makes it possible to optimise RayScan Mobile for each particular application. 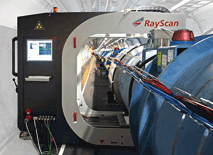 RayScan Mobile has been adapted to investigate the interconnection zones of the worlds largest accelerator ring LHC at CERN. 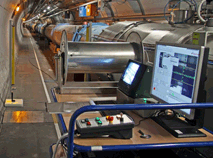 The storage ring has a circumference of 27 km and a diameter of 1100 mm. It is possible to visualise details like solderings, debris and the position of contact fingers with an accuracy of about 0.1 mm. Time for measurement incl. reconstruction 3 - 30 min.